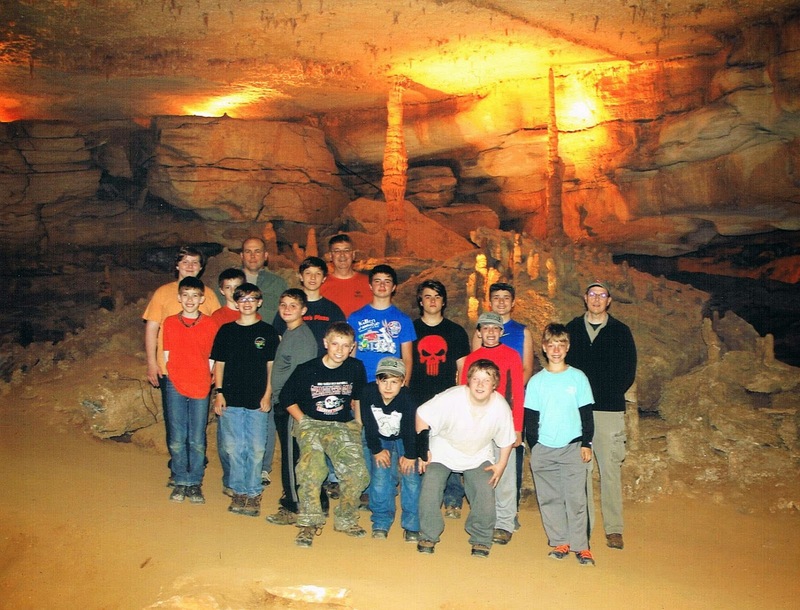 Troop 50 Scouts experienced a different sort of camping experience this past weekend at Cumberland Caverns in Tennessee. 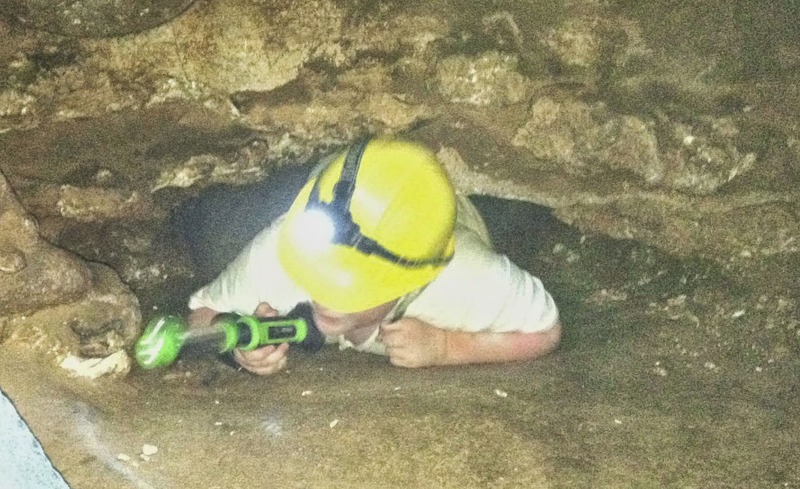 Seventeen of the troop's Scouts and adult leaders spent the night deep underground after a spelunking tour through an undeveloped section of the cave. This trip marks the second time the troop has visited the cave but was a new experience for all but four of the troop members who attended. The troop contingent pauses for a group photo during the scenic walking tour. After a Dutch oven dinner outside the cave, the Scouts packed up their personal gear for the hike into the cave. Once inside, we were assigned a camping spot on the floor of the cave and just had time to drop off our gear before heading out on the scenic walking tour of the interior. The waterfall in the cave. During the walking tour we were introduced to a moonshine still, the remains of a pre-Civil War saltpeter operation (for making gunpowder), a real crystal chandelier (transferred from a New York Opera House), hundred year old cave graffiti, and a waterfall sprouting from the ceiling of the cave. We were also introduced to some of the cave wildlife such as cave crickets and a bat hanging from the ceiling. 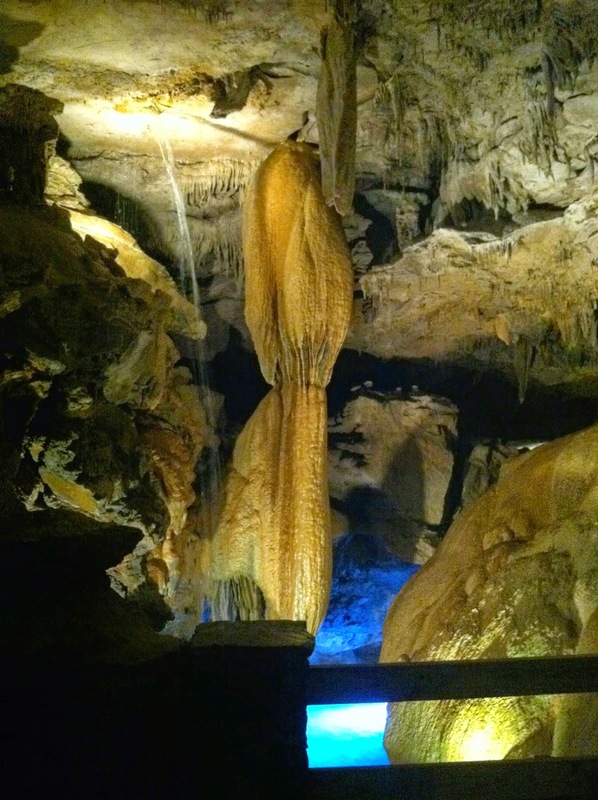 The walking tour has traditionally concluded with a light show among some of the grand formations of the caverns. The lights were accompanied by a dramatic reading of the first chapter from the book of Genesis and was quite inspiring. This light show has been used for over thirty-five years. However, the light show we saw was about the discoverer of the cave, Aaron Higgenbotham, being stuck in the cave for three days after he dropped his torch. Somehow, the effect wasn't the same. When questioned, our guide revealed that complaints about the religious nature of the program had led the owners of the cave to change the show. Following the walking tour, we donned helmets and headlamps to head out on the "wild" tour through an undeveloped part of the cave. First, we were required to crawl through an eleven inch high wooden box to make sure we could fit through the smaller portions of the route. The crawl through the box gave some of the Scouts time to reflect on what they would face in this part of the cave, which caused a little apprehension. Soon, however, we were climbing ladders, squeezing through narrow passages, and crawling through small holes in the rock. Rusty and Carl climb the ladders at the start of the tour. Jason squeezes through a tight space. For almost two hours we twisted, turned, crawled, ducked, and (insert your own action verb here). The final stretch of the route traversed an area known as Bubble Gum Alley due to the sticky mud found there. 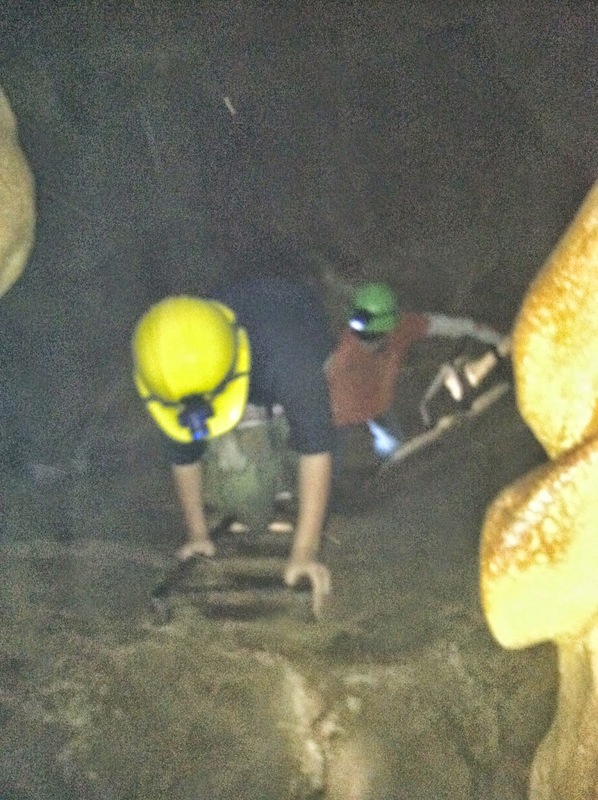 By the time we emerged into the main section of the cave, we were liberally coated with mud. Fortunately, strategically placed wash basins greeted us at the end of the tour and allowed the Scouts to (partially) adhere to the obligation of the eleventh point of the Scout Law (a Scout is clean). Despite the fact that it was around 11:30 PM, most of the Scouts headed to the cave's snack bar to renew their strength. The remainder of the evening passed uneventfully, although our sleeping location near the restrooms meant we heard a number of footsteps through the night as other participants walked back and forth to visit the facilities. Reveille sounded at 7:00 AM, appropriately accompanied by the Beatles singing "A Hard Day's Night." Following breakfast in the Volcano Room of the cave, we packed our gear and headed back above ground. The weather was clear when we emerged into the light, which allowed us to easily change back into uniform and load up the vehicles. The promised rain did fall, quite heavily at times, during the ride back to Auburn but all returned safely to town by 2:30 PM. The weekend served as the first troop campout for our five newest Scouts and a new adult leader. All of them performed well and seemed to enjoy themselves. We look forward to many good outings with them. The other Scouts also enjoyed themselves, with "great" being the most often used adjective to describe the trip. One of our adult leaders was unable to make the trip due to a health problem. We wish him well and give our special thanks to Rose Zuk for stepping in at the last moment to drive part of the group to Tennessee. Our adult leaders and parents are key to the success of our troop. Many thanks for all of the help. More photos of the adventure are available in the online photo gallery.